Train your elementary aged students to work as an environmental engineering team. They learn physical and chemical properties of oil while experiencing how engineers and scientists approach oil spill disasters. The perfect hands-on activity to pair with your favorite elementary level oil spill book. Students create their own oil spill models and use them to simulate basic oil containment and removal techniques. They learn to measure data and compare results. 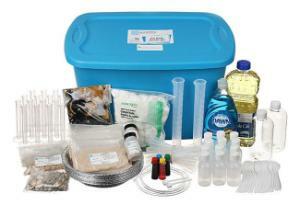 Ideal for implementing scientific process, establishing problem solving skills, and introducing inquiry based learning. Includes multiple sets of worksheets for differentiated learning. Ordering information: Kit contains Instructor’s Manual with Reproducible Student Pages, Dawn dishwashing liquid, Vegetable oil, Vinyl tubing, Cocoa powder, Graduated cylinders, 10 mL, Graduated cylinders, 100 mL, Feathers, Food coloring, Flip cap bottles, Aluminum pie plates, Sand, Pea gravel, Seashells, Plastic pipets, Plastic spoons, Cotton balls, Bottles, 500 mL, Small measuring scoop, Storage Container.